Anybody with kids over the age of 8 will have heard of Captain Underpants. You know, the popular series of books filled with talking toilets, fart jokes and a smiling superhero in a pair of big white undies. What on earth could be funnier to a kid? When Captain Underpants: The First Epic Movie arrived at the cinema late last year, my two girls were literally dying to see it. They begged and pleaded for me to take them until I finally agreed. After all, a trip to the movies is one of our favourite ways to escape as a family. I’d never actually read any of the Captain Underpants books on our shelf and I must admit that the thought of having to sit through potty humour for an hour or two didn’t overly appeal to me. Toilets and fart jokes just aren’t as funny to parents as they are to kids, right? Well, Captain Underpants proved me wrong. I laughed at least as much as the kids, and possibly louder too. If you happened to miss Captain Underpants at the movies, or enjoyed it so much you need to see it again, you’re in luck because it’s now out on DVD. 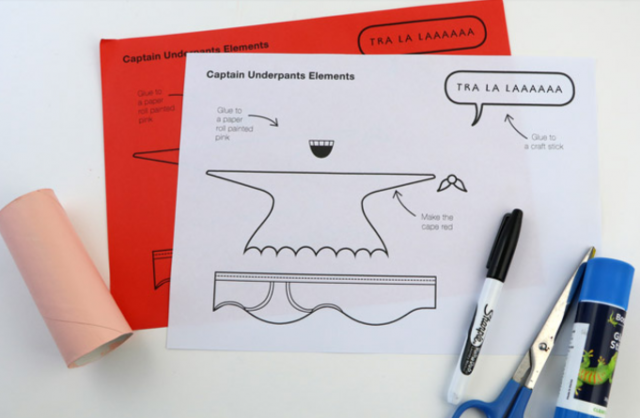 You can escape into some serious laughter any time you like in your own home, and when the movie is over you can escape into some crafting with our Captain Underpants character craft. Best of all, you can even make him from a toilet roll! 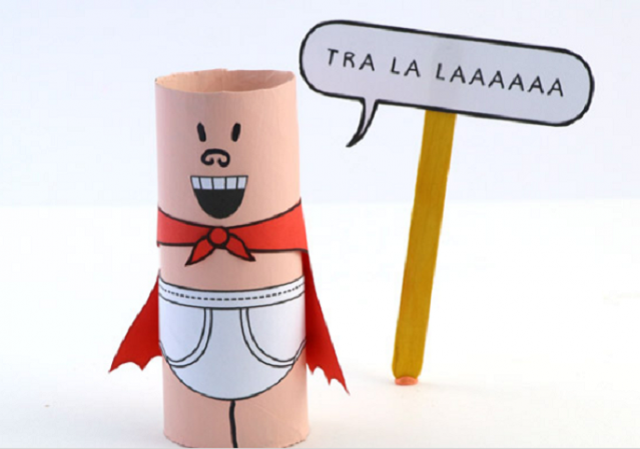 Paint your paper roll the colour of Captain Underpants’s pink skin and allow to dry. Print out our template. I’ve printed it out twice, once on white paper and once on red paper for the cape, but if you don’t have red paper (or if you want to be less wasteful) print it out once on white and colour the cape in red instead. Cut the shapes out and glue into place. Draw a curly nose and two beady eyes above the big smiley mouth. 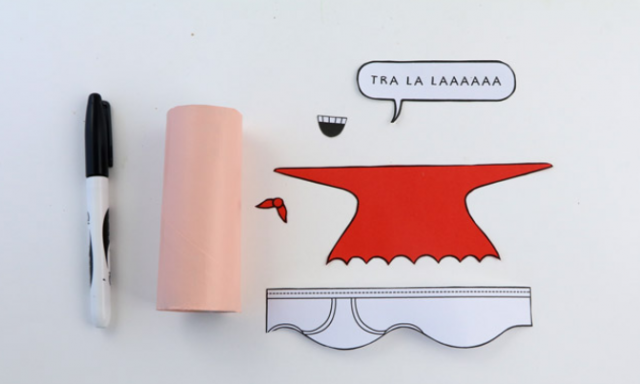 Glue the “TRA LA LAAA” speech bubble onto the end of a craft stick. That’s all there is too it. Now the kids will surely be entertained with their own DIY Captain Underpants doll for many happy hours.